America’s Most Haunted code update and new Auto-Programmer! Thanks to Christ Kraft we now have an easier way to update the America’s Most Haunted pinball machine. This coincides with the holiday release of code version #16! Visit the AMH Code page to download the new files and give yourself the present of code! I finally wrote up a “Making Of” history for our custom pinball machine “America’s Most Haunted” You can read the whole story and watch the embedded videos here. 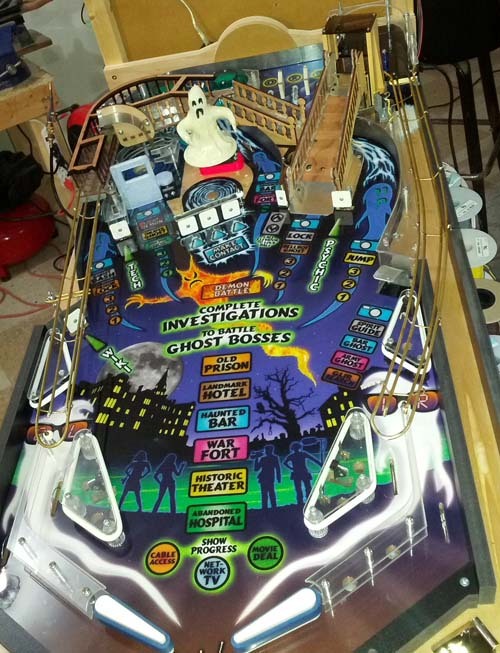 America’s Most Haunted is currently in production and you can order one for yourself by visiting Spooky Pinball’s website. Enjoy! A beautiful sunny day, perfect for programming! Fixed glitch where CREDITS:X and FREEPLAY didn’t appear on attract mode videos after a game had been played. Fixed some end-of-multiball issues with music not resuming, mode total not being display. Fixed issue with game “forgetting” about Hellavator MB if you stack Minion MB onto it. Added “color prompts” to GI. Each mode has a color (minion = blue, ghost bosses = green, MB = magenta) Making shots towards modes briefly flashes their color to guide player. MB and Minion already did now, now Ghost Investigation Shots do too. Changed countdown “seconds” timer to more accurately represent actual seconds 🙂 Bit longer than actual seconds, but feel right. Increased some seconds allowed amounts to reflect new, faster timers. All I’ve got for Easter Dinner is Spam. But I made a turkey sandwich. Re-writing Loop Catch routine so it’s modular, faster, and works for any mode. This is when we want to catch a ball in the Ghost Loop and hold it with the targets. Added “Speed Demon” bonus if you hit the loop so fast the magnet can’t catch it. Turns a deficiency into player compliment! Testing magnet ball hold at 25% duty cycle. I’d rather the magnet stay cool, than catch every ball every time. Only a few modes catch the ball outright anyway. Performing cycle testing on new Loop Ball Catch code – it either needs to catch the ball (preferred) or acknowledge it missed it. Fixed glitch where targets wouldn’t make sounds on Minions #4 and up. Three day weekend? What’s that? Tweaked move time to about 5 seconds per shot. You have to hit 6 moving shots to beat the demon. So it’s like the AFM Super Jackpot, times 6. Nobody ever said this game was going to be easy! Need to implement correct FAIL condition for Wizard mode. If you fail out, it’s re-lit on next ball. Improved strobe shot lighting for Demon Shots. Have a few hours today to work on code. Starting to debug Wizard Mode, so it can ship with the game. Need to implement the “actual magnet ball trap check” for shot #2 of Demon Mode, like the start of Haunted Bar has.